Other air spaces can also experience painful disequilibrium. The air space created inside of a diver’s mask can lead to face squeeze, which is remedied simply by exhaling through the nose. Trapped air within a tooth secondary to decay, a filling or an abscess can lead to tooth squeeze (barodontalgia) with either an increase or decrease in external pressure. If the external ear is occluded with cerumen, the area between this plug and the tympanic membrane can become squeezed. This is called external ear squeeze, which can also lead to pain and tympanic membrane rupture. Finally, if any of the openings to the sinuses are occluded or become occluded while diving, sinus barotrauma can occur. This can lead to hemorrhage or paresthesia in the distribution of the infraorbital nerve. Thus, it is recommended not to dive if taking decongestants due to the risk of occlusion as the medication begins to wear off. The majority of injuries caused by barotrauma of descent, excluding inner ear trauma, heal spontaneously. Decongestants, as mentioned previously, and antihistamines may help promote opening of the occluded airspaces. If there is concern for contamination after tympanic membrane rupture, antibiotics can be considered. Ambient pressure decreases when ascending from depth, causing gases to expand. This expansion can lead to various injuries including alternobaric vertigo, pulmonary barotrauma, aerogastralgia and arterial gas embolism. This mechanism of expansion also plays a role in these conditions due to inert gas dissolution (i.e., decompression sickness and nitrogen narcosis). Alternobaric vertigo is caused by air trapping within the middle ear. Trapped air expands causing the formation of a pressure differential. This induces symptoms of nausea, vomiting and vertigo. If this pressure is transmitted to the facial nerve as it travels through the middle ear and mastoid process, facial nerve palsy may occur. No treatment is necessary if nerve impingement has not occurred as alternobaric vertigo is typically temporary, and the gas will be absorbed by the surrounding soft tissues over time. If the nerve is affected, expert consultation should be sought. Pulmonary barotrauma is pulmonary damage and possible rupture secondary to gas expansion within the lungs. Divers are taught to exhale during ascent in order to allow excess gas volume from gas expansion to vent from the body. Thus, this condition is more often seen in panicking divers. Holding one’s breath can lead to over-expansion lung injury including pneumomediastinum, pneumothorax and cerebral artery gas embolism. Symptoms may include chest pain, cough and hemoptysis but without neurologic findings. For minor cases supportive care is all that is required. Development of a pneumothorax typically requires drainage but does not require hyperbaric recompression unless a gas embolism has also formed, in which case the pneumothorax is drained beforehand. Neurologic symptoms should prompt evaluation for gas embolism or decompression sickness. 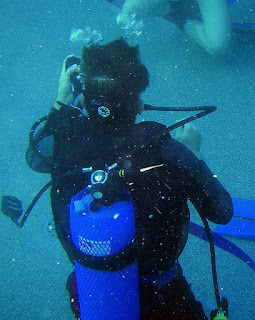 Arterial gas embolism in the setting of diving is most often secondary to pulmonary barotrauma, and typically occurs within two to ten minutes after surfacing. The most serious example is that of cerebral artery gas embolism (CAGE). Symptoms can include loss of consciousness, seizure, blindness, disorientation or hemiplegia. Signs and symptoms may seem disjointed in cases where a shower of bubbles has affected diverse areas of the brain. All cases of gas embolism require recompressive hyperbaric oxygen therapy as soon as possible. High flow supplemental oxygen should be administered in the interim (10L/min non-rebreather mask). Decompression sickness (DCS) occurs when bodily fluids become saturated with an inert gas (i.e., nitrogen) during descent. During ascent, gas expansion causes bubble formation in bodily fluids and tissues leading to an inflammatory response with possible obstruction. Type I DCS is mild and involves the joints, extremities and skin, with the shoulders and elbows most commonly affected. The pain has typically been described as a dull ache but may be sharp or stabbing and exacerbated by movement. It may also radiate into the surrounding tissue. Type II DCS is more serious and can involve any combination of neurologic, cardiac, pulmonary, and vestibular dysfunction. Symptoms most often begin one to three hours after surfacing but one to two percent of people affected may have symptoms that appear 24-48 hours later. Hyperbaric recompression is essential in the treatment of DCS and, as above, high flow supplemental oxygen should also be administered. An IV infusion can be started to help flush the system of emboli obstruction. For questions on medical care in the field, the Divers Alert Network (DAN) operates a medical emergency hotline that can be reached 24 hours a day at 919-684-9111. Buzzacott PL. The epidemiology of injury in scuba diving. Medicine and Sport Science (2012): 57-79. Web. 15 Sept. 2015. Tintinalli JE and Stapczynski JS. Chapter 208 Dysbarism and complications of diving. Tintinalli's Emergency Medicine: A Comprehensive Study Guide. 7th ed. New York: McGraw-Hill, 2011. 1410-413. Print. Chandy D and Weinhouse Gl. Complications of SCUBA diving. UpToDate, 10 Nov. 2014. Web. http://www.uptodate.com/contents/complications-of-scuba-diving. Accessed 07 Sept 2015.